While in America I got one of these frames sent out to me. A Raven 234 Acro full carbon frame. I wanted to improve my acro flying and I felt the only way I could do that is with a nice small really strong frame. As I crash a lot and usually hard. As evidence from some of my videos. I tried the Hoverthings frame and it flew great and was fun, but was a little big. So after a lot of research I decided on the Raven, Brain from FreebirdRc has been great with communications and answering my questions. It was delivered very fast while I was in the US staying at a friends place, Brian shipped it out fast to make sure it arrived before I left. Once I got back to New Zealand I found some time to start the build up of the frame. I had some parts that I wanted to reuse, and some key requirements that are particular to me. The plan was to use DYS1806 2400kv spinning 5040 on 3s to start with and feel my way up to 2204 spinning 6045s on 3s once my skills improved. So on with the build, Once thing to note, this thing is small, really small with very little room to place anything, even a Naze32 board seems big on it. The biggest challenge was to try and get everything on the frame and mounted. I spent a few hours trying different options and layouts. The below one is what I settled on. It wasn't going to be the tidiest, But I knew that I would change soon, either due to crashes or new parts to try on it. The ESCs are ZTE opto 12amps these are small, but look big on the frame, and were harder to mount than I thought they would be. I used a PDB to make the wiring "less" messy. Once I mocked it up and got positions sorted it was time to solder. Next I needed power. I 3D printed a XT60 holder that would fit between the frame plates and make a very secure connector. Once in place I planned to hot glue it. I had to mount the PDB and feed the battery wires up through the frame and solder inplace. I didnt really like this solution, but for this build it worked out really well. Next it was time to secure the ESCs, I used 3M double sided tape and small zip ties. Next was to tidy up the ESC cables. Since the are opto ESC I removed the power cable, leaving signal and ground. I then shortened to fit the frame. I also added a 5v regulator to power the Naze32 and D4RII receiver. This was zip tied over one of the ESCs. Test fitted to get the lengths of the ESC wires, Once the length was decided it was time to solder the connectors back on. All wired up bar the receiver. The Naze32 is isolated with small rubber o-rings to help reduce vibrations from the frame. The mess that hides under the Naze,. I also added a small white LED strip to help with orientation. It was just hot glued to the frame. I used a FrSky D4RII receiver using PPM, I just soldered a short servo cable to the Naze long enough to just fold around to the D4R. The last two wiring parts were that telemetry cable for the D4R and a buzzer. The D4R was doubled sided to the top cover plate and the antennas were shrink wrapped to some zip ties off the top plate. 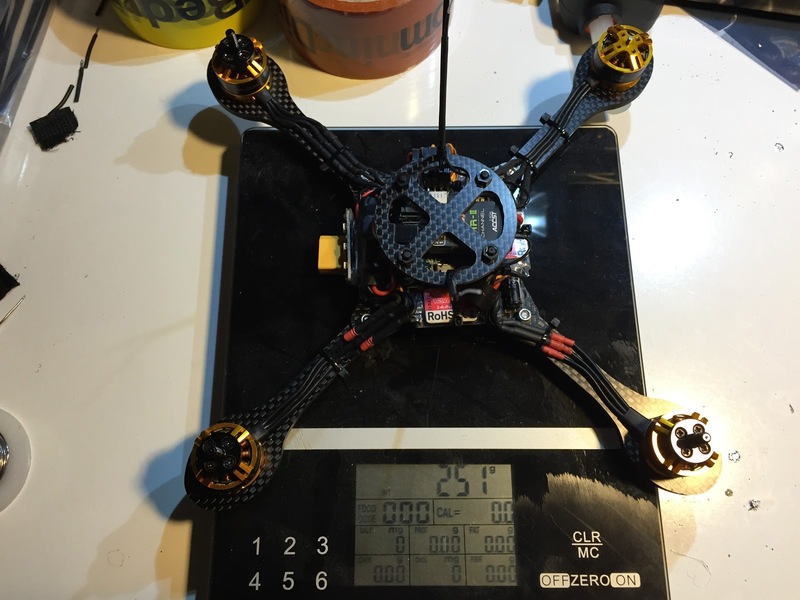 Over all the build is not the tidiest, But is fully functional and was ready for me to go flying. I loaded up baseflight and configured the board. All up weight I was really happy with coming in about 260grams (by the time you add props and nuts) about 380 with 1500 zippy compact. Well this little frame rocks, unfortunately I do not, After putting on a base tune and doing some test flights I crashed a lot. I was use to heavier less agile combos that my timing was completely out and I was either over rotating and powering out at the wrong points. I ended up chipping a few edged on the arms, but over all the frame showed complete disregard for my incompetence. However I then went to a larger park and started increasing speed and multiple flips, that's when it really went all wrong. I was practicing the power up flips, the one where you power into the flip and then reduce power a lot and it causes the quad to do multiple fast flips under no power. Well I got my timing wrong and it hit the ground hard. The frame was completely fine, However the DYS1806s were not. I managed to bend 3 shafts and snap another completely, yip 4 for 4 damage. The shafts in the DYS1806s are very thin, about 2.5mm and do bend easily. Not ideal for acro crashes. Of course this happened on my first battery and that was my day done. Decision time. 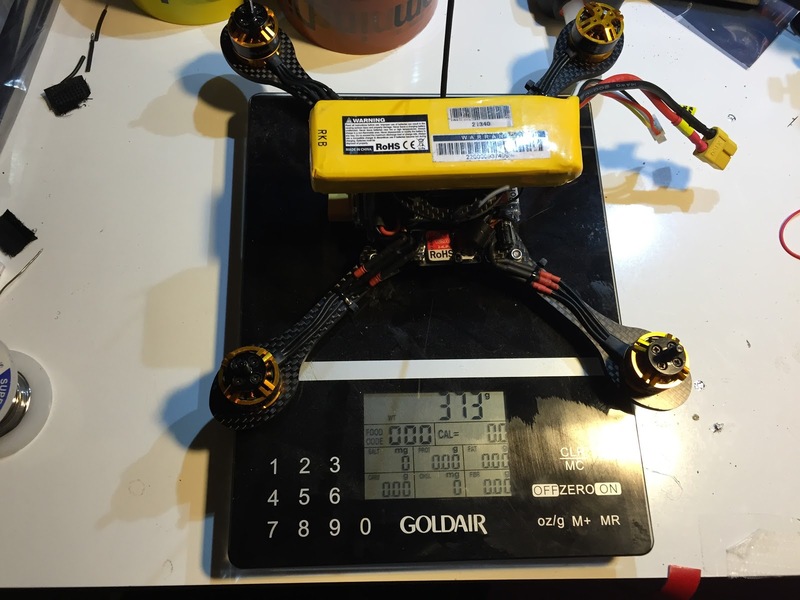 I had just sold my fatshark goggles and has some cash so I decided that I needed rebuild this quad, and put stronger motors on it. I decided on EMAX 2204, since I already had 2 spare from one of my other orders, I have crashed them hard and they seem to have survived well. Plus 2204 will easily spin props from 5040 - 6045 so easier to find my preferred combo. These will allow me to make a very clean install, very much looking forward to getting these part to redo the frame in a tidy build that the frame deserves. So what to do with the current parts. We I had a cheap hobbyking 260 frame that I had planned to build up and a learner frame for my daughter. So there is no time like the present and since I had done all the hard work it was easy to transfer over to the other frame. First step was to strip the Raven. The HK 260 has a larger center space, I marked up where the holes for a 35x35 board needed to be and drilled holes through the frame. Then it was just a matter of mounting the already complete PDB. The ESC easily and tidily slotted around the PCB in the center cavity. Add a old Naze and its nearly done. But is made for a nice tidy quick build. I used he repaired DYS1806s as this will just be a hack flier. Now its a waiting game for my new parts so I can make a super awesome build of the Raven. Look for that build coming soon. Will this confirms how strong the raven is, This is what happened to the above build after a small crash. Cant wait for the new bits to arrive.